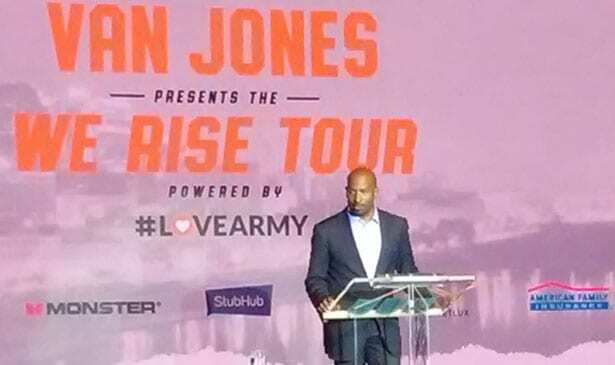 NASHVILLE, TN — Political commentator and former special advisor in the Obama administration Van Jones brought his We Rise Tour to Vanderbilt’s Langford Auditorium, along with guests Demi Lovato and activist Connie, to discuss the recent attacks in Charlottesville, Va. and other current issues. “When they’re marching and when they have their torches and the President of the United States can’t distinguish between people who are using violence to oppress people and people who are basically trying to defend themselves, there’s something wrong,” Jones said about the Charlottesville attacks. She also offered words of wisdom for President Trump, who condemned the neo-Nazis in a statement on Aug. 14, but went on to say “there is blame on both sides” during an Aug. 15 press conference. “Sitting here as a victim of a terrorist attack in this country, I am frightened and I am scared about the direction that we’re going and if we don’t stop with the hate and the bigotry that’s what going to sink this ship and I don’t want that to happen,” Connie said. Jones, a native of Jackson, Tenn., spent a lot of time as a student activist in Nashville, and called on the south to continue to show “dignity” and “common sense” in the midst of the country’s turmoil. “We need to start to rise up right now to show the country our true character. Right is right, wrong is wrong, and what you’re seeing right now is not left versus right, it’s right versus wrong,” Jones said. Next articleWill the New War on Drugs Target Crime Bosses or the Poor?